Vauxhall Motors Celebrate 25 years of speedy saloons. This year, Vauxhall is celebrating the 25th anniversary of one of its most famous and dramatic models, the Lotus Carlton, which started a long tradition of Griffin-badged performance saloons that still survives today. 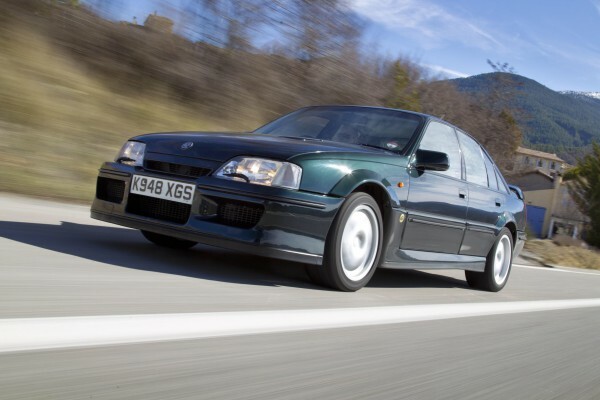 The Lotus Carlton was the fastest four-door saloon in the world when it was launched in 1989, 65 years after Vauxhall produced Britain’s first 100mph road car. With 377bhp from its straight-six, twin-turbocharged engine, the Carlton could achieve the 0-62 sprint in 4.9 seconds and would go on to a top speed of 176mph. Its chassis was developed and fine-tuned by Lotus, resulting in a highly dynamic car with the handling capabilities and top speed to keep up with the finest supercars of the day. A total of 440 Lotus Carltons were produced from 1989 to 1994 as a joint project between Vauxhall and Lotus, with each car costing an eye-watering £48,000. After the Lotus Carlton there were talks of a successor, but the project did not go ahead, meaning the 3.0-litre quad-cam engined Omega produced from 1993 to 1997 became the final large performance saloon for Vauxhall through the rest of the 1990s. By the early 2000s, though, large performance cars were firmly back on Vauxhall’s agenda thanks to the all-new VXR range. In 2007, it spawned the 420PS VXR8 saloon, based on sister-company Holden’s Clubsport R8. All of a sudden Vauxhall had BMW and Mercedes in its sights, and with good reason: the VXR8 produced an impressive 420PS from its 6.0-litre V8 engine and managed the 0-60 sprint in under five seconds. But there was more to come. The supercharged limited edition Bathurst S joined the VXR8 range in 2009 costing less than £45,000, making it the least expensive car with 500PS+ at the time. The car developed a colossal 577PS and 720Nm of torque, with the V8’s grunt and supercharger’s whine providing a truly spine-tingling soundtrack. All of this power teamed with an array of performance modifications over the standard car, made the Bathurst an astonishingly fast and capable performance saloon, equally at home on the road or the track. Vauxhall’s latest incarnation, the VXR8 GTS, produces 576bhp in its current form – more power than its main rivals the BMW M5 and Mercedes E63 AMG, yet costing a substantial £20K less. Previous The Humble Opinion: I’m backing Britain – regardless who owns it! It was great to click on your site and the first thing that came up is a shot of that awesome car!